The Teplice Regional Museum is housed in Teplice Castle in the beautiful old part of the spa town. In the second half of the twelfth century, Queen Judith of Bohemia founded a Benedictine convent on the site of the later castle. 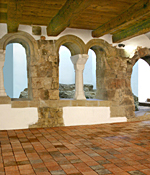 In the second half of the fifteenth century, under the Bohemian queen Joanna of Rosental, a fortress was built on the ruins of the convent, incorporating remnants of the Romanesque and Gothic masonry. Under its eighteenth-century owners, the castle became a meeting-place for individuals prominent in politics and society such as Charles Joseph de Ligne, Giacomo Casanova, Johann Wolfgang von Goethe, Frédéric Chopin and Franz Liszt. 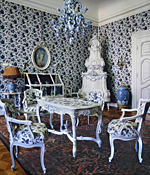 Inside the castle, splendid interiors have been preserved, including the Renaissance hall with its painted coffered ceiling and the Rococo salon featuring opulent stucco decoration. Since 1947, the castle has also accommodated exhibitions organized by the regional museum on the history of the town, the spa and the region, drawing from museum’s holdings of some 750,000 objects. In the Romanesque section of the complex, a presentation entitled “In Search of the Vanished Convent” is on view.